While we talked about the effects of the economy on the bike business in two other posts (click here and here), mainly in the form of bad news, here's one that's much more positive. The article appeared in the Ames Tribune (Ames is in Iowa), making top headlines with a very suggestive title. Its pretty nice to hear that a bicycle company's experience with tough finanical times made the headlines and possibly sets an example for others. Honestly, I've never heard about this company before I read the article and I must say their way of doing business is a very interesting one. Let this be a case study for those of you in the industry. Enjoy the reading! Few businesses can claim the balance sheet Cycle Force Group can boast. The international bicycling marketing company based in Ames, has enjoyed an average of $20 million of sales over the past 10 years and has no debt. Twelve months ago, when Cycle Force President and CEO Nyle Nims looked ahead, he couldn’t see any bumps in the road. Then the company’s local banking partner abruptly put the brakes on its credit line. Nims said Cycle Force was one of the first businesses to suffer from the unsecure mortgage industry, which made the banking industry nervous about all credit. With long-term sales looking good, but no credit from which to manage his cash flow, he and Vice President Sue Cunningham were preparing to close the doors. Until the 11th hour. “Literally, the final hour,” Cunningham said. The company, which was called Cycle Source, partnered with one of its largest clients, Cycle Force, a British company. They merged as one under the Cycle Force name with Nims sitting in the driver’s seat, or lead bicycle saddle, as it were. Last year, the company had $3 million in revenues due to the banking credit fiasco, Nims said. But the company is well ahead of budget goals for this year and may likely outpace its 2007 revenues. “2010 will be very, very good,” Nims said with a smile. Nims is a hometown boy who made it big. In 1969, he returned home to Ames from the Vietnam War to work in his dad’s business, Nims Sporting Goods, and attend Iowa State University. In 1980, Nyle started traveling for the store as a Midwest representative for the mopeds his father sold in the store. Shortly thereafter, he added Ross bicycles to his territory. By 1992, he was president of Ross Bicycles. “Through attrition, I just worked my way up,” Nims said. With the Ross family, Nims directed the bicycle company into a new area with promotional marketing of specialty bicycles. However, with bicycles from China coming in and flooding the United States markets with cut-rate prices, Ross bicycles cut back on the specialty market. So Nims struck out on his own, taking with him Cunningham, who was the Ross director of fitness, marketing and international sales. Since breaking out on his own in 1998, Nims has expanded the company into nearly every area of bicycling marketing available. He contracts with bicycle manufacturers in China to make a product to his specification. He then ships it to his corporate headquarters in Ames. The warehouse located next door to the offices is floor to ceiling with bicycles. As his clients send in orders, he trucks out bicycles. Nims’s customers are other businesses, not the person sitting on the bike. But no matter how someone ends up with one of his bicycles, he stands by his product. Each one has a permanent sticker attached to the frame so the user can call with questions, concerns or problems. Cycle Force provides promotional bicycles to companies for a variety of uses. In his show room, Nims has bicycles featuring his company’s designs for Sunkist, TrueValue, Bank of America and Jack Daniels. Nims also markets bicycles for movies. His team is working on a new bicycle for the Transformers 2 movie. And they market bicycles for companies such as Kawasaki, Polaris, Smith & Wesson and Ford. He has made bicycles for several universities, including Arizona State and the University of Tulsa. He’s hoping to add ISU to that list. “If we can ever find the right contact there,” he said. Another area of the business is e-marketing. Nims said he was the first to start selling bicycles on the Internet. He has product on 30 to 40 different Web sites. “You can even get our bicycles on Amazon.com,” he said. The company has 14 employees after relocating to Ames less than three years ago from Long Island, N.Y. The cost of business there was prohibitive, Nims said. So with his roots still in Ames, he enticed his employees to Iowa with a trip during Veishea weekend in 2006. By June of that year, six of his employees agreed to relocate to the Midwest. 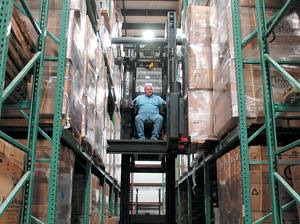 Because of the lower cost of business in Iowa, Nims said he was able to save $500,000 a year by moving the company from Long Island. Since nearly shutting down the company last year, Nims is pleased to report on the company’s growth, including a new contract with Toys R Us.